Hendrick's Bridge Wayside Park Boating Facility Improvements Hydraulic Design (OR) | WEST Consultants, Inc.
Lane County, in cooperation with Oregon State Marine Board (OSMB), is proposing modifications to the existing boat launch ramp and parking lot at the Hendricks Bridge Wayside Park. The Park is located immediately upstream (east) of the McKenzie Hwy (OR126) bridge. The existing concrete and asphalt launch ramp is in poor condition, with considerable erosion at the ramp toe. The ramp toe is typically out of water during summer months exposing a large drop-off and making the site virtually unusable. The alignment of the ramp is almost perpendicular to the river flow making it difficult for boaters to safely launch and retrieve. OSMB requested that the new ramp provide year-round river access. 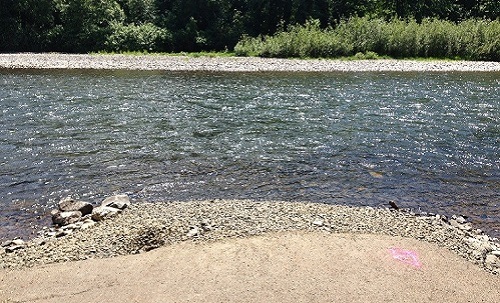 The Marine Board and Lane County Parks asked WEST Consultants to evaluate the design of the ramp and associated improvements to insure it will not impact the FEMA regulatory floodway. Due to concerns from the Oregon Department of Transportation (ODOT) regarding potential impacts to the Hwy 126 bridge piers as a result of the proposed projects, a 2-dimensional hydraulic model was developed to evaluate potential changes in the magnitude and direction of flow adjacent to the bridge piers. WEST developed a HEC-RAS hydraulic model to determine the hydraulic conditions for the site and conduct the no-rise floodway analysis. WEST also developed an SRH-2D hydraulic model to evaluate the hydraulic impacts of the new ramp on the existing bridge piers. The hydraulic data were used to size the riprap material, estimate scour depths, and determine the revetment toe down elevations.